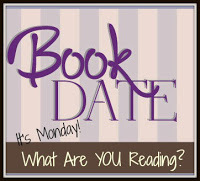 Book By Book: It's Monday 10/29! What Are You Reading? I hope you are feeling better soon. The Lost Ones sounds good to me. Come see my week here. Happy reading! Thanks, Kathy. I really enjoyed The Lost Ones. Oh that's so good to hear you loved America's First Daughter, even though not from USA I'd have to say I'm tempted. I love your traditions around Autumn too, we don't do that, we just grow the kind of pumpkins you eat! (I've just been planting mine out!). Hope that immune disorder gives itself a rest and takes a hike soon. Thanks, Kathryn - still having a tough time here. But yes, I think you'd like America's First Daughter - it also deals with the French Revolution since Jefferson & his daughter were in France at that time. I’m so sorry you’ve not been feeling well. I’m glad you’re trying to listen to your body and take it easy. We did not make it to the pumpkin patch this year. AND we did not grow our own pumpkins — it feels like a very “off” year for us in that regard. On America's First Daughter -- it’s wonderful when we’re pleasantly surprised by a book we though we would hate. YAY! Now I’m going to have to go look up How to Hang a Witch to see if we have it locally. Thanks for the suggestion! Thanks, Shaye - I have SO much trouble getting myself to rest & accepting not being productive! I'm jealous you get to experience trick-or-treating tonight, even if you didn't have time for pumpkins - those were such fun times for us!! Hope you continue to feel better!!!! P.S. Intrigued by America's First Daughter. Anything you read that quickly must be good! Thanks, Kellee. The sick time helped speed up my reading but it WAS a very good book! Wow, you did get a lot of reading done. I hope you feel better soon. Have a good week. The up side of feeling down is having reading time! I hope though, that you are feeling better. I am not so good at listening to what my body needs and can end up really sick. I'm much better now that I am retired though. I am impressed with all your reading. I'm not so good at reading the scary stuff, but am listening to Killers of the Flower Moon: The Osage Murders and the Birth of the FBI. It's more than enough for me! Same here, Cheriee!! Very tough for me to accept not being productive & rest as much as I need to. I'm determined today though! Oh, Killers of the Flower Moon was sooo good - and dark in it's own right, even more so since it is true. I bet it's great on audio. Enjoy! That's so great that you ended up loving the book club book! And that is such a coincidence that you mentioned cider donuts. I have never heard of them before, but a friend who used to live in NY told me about them yesterday. She says they are devine. Guess it's an East Coast thing - lots of apple farms here :) Soooo yummy!